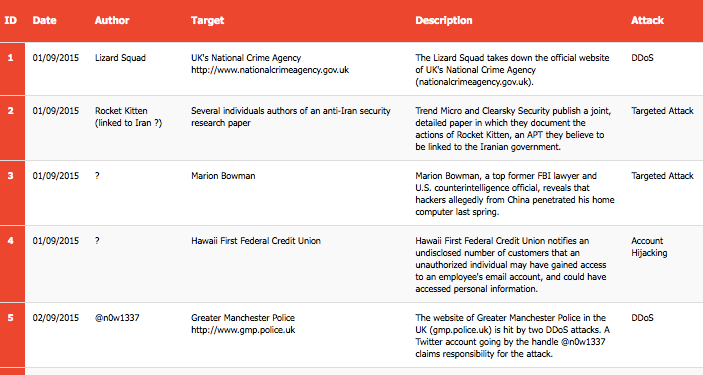 It’s time to publish the first Cyber Attack Timeline of September. Unfortunately this fortnight has brought another massive breach against insurance providers: Excellus Blue Cross Blue Shield and Lifetime Health Care have been hit by a cyber attack initially occurred on December 2013, which has compromised the details of 10.5M users. Other interesting events concern a new Cyber Attack against the Pentagon (in this case limited to the Food Court computer system), the revelations that attackers successfully compromised U.S. Department of Energy computer systems more than 150 times between 2010 and 2014, and an intrusion, allegedly performed by Jihadists, into UK ministerial email accounts. The chronicles also report the first cyber attack carried on via the implant of malicious router software images, and an anomalous occurrence of DDoS attacks, quite widespread, targeting, among the others, the UK’s National Crime Agency and the Kremlin’s official Website. 11 03/09/2015 ? uk.match.com In an attack similar to the one that happened last month on PlentyOfFish, Malwarebytes reveals that the UK version of online dating site Match.com (uk.match.com) is caught serving malvertising.